When the thoroughly poised Charlotte Worthington requests that Miss Thorn and her cat Fortune find her a position, she never dreams the savvy employment agency owner would reunite her with Matthew Bateman, her brotherâs former bodyguard. Matthew is about to be knighted for an act of valor, and he and his sisters could use some polishing if theyâre to enter Society after his elevation. Yet how can Charlotte maintain her calm, cool demeanor as their sponsor when she harbors a secret love for him? Matthew Bateman cannot forget the beauty who is miles out of his league. Once a boxer called the Beast of Birmingham, Matthew would like nothing better than to be worthy of Charlotteâs hand. As old enemies and new ones attempt to bring him low, can Matthew prove to Charlotte that their love is meant to be? This sweet, clean Regency romance is the sequel to Never Vie for a Viscount. Fortuneâs Brides: Only a matchmaking cat can hunt true love. I have to be quite honest. Never Kneel to a Knight brought to mind something I’ve never encountered before in a historical romance, nor thought about. Boxing. For years I’ve read about Gentleman Jackson and his training and matches but obviously it never clicked that boxing, though an excellent form of exercise, at the time was meant to be only for ‘lower classes’. Yes, it clicks now, but I’d never focused on it previously. Though I really enjoyed Never Kneel to a Knight it isn’t my typical read. There’s a lot of family drama and emotional upheaval in this book that literally broke my heart. Matthew’s struggle to be true to himself while trying to elevate his station for his sisters’ sake was humbling. Ivy’s Christian love and family service is one I’ll forever use as an example in my life. Daisy’s defense and protection of the ones she loves is inspiring. And Petunia’s innocence through everything they’ve lived through is a testament to true family love. That Charlotte took them on and gained their trust and love was as amazing as it was heartwarming. Never Kneel to a Knight is a perfect example of how God’s love can be a light shining in the darkness. 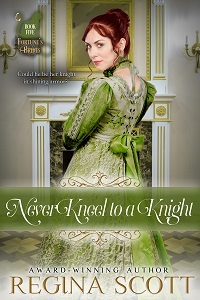 I loved Never Kneel to a Knight and can’t wait to find out which bride Fortune choses next!